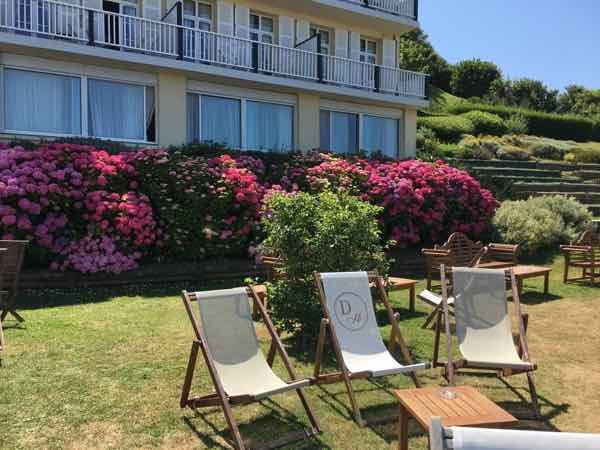 When I first arrived in the seaside town of Etretat at my Airbnb, my hostess pointed out a hotel that had exceptional views of the cliffs and the village. She said having lunch or dinner, or even having a drink at the Hotel-Restaurant Dormy House (just around the corner from my house) would be worthwhile. 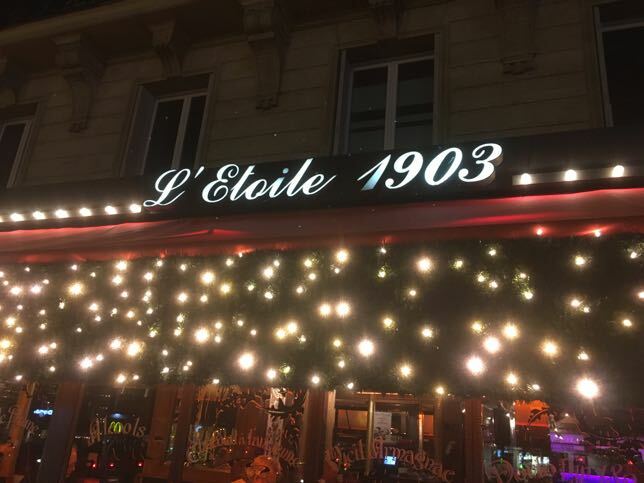 As I wanted to have a meal with views of Etretat, this sounded like the place to go, especially at lunchtime when it would be a bit less expensive. Even though I did not have reservations, I got a table outside, overlooking the sea and town. 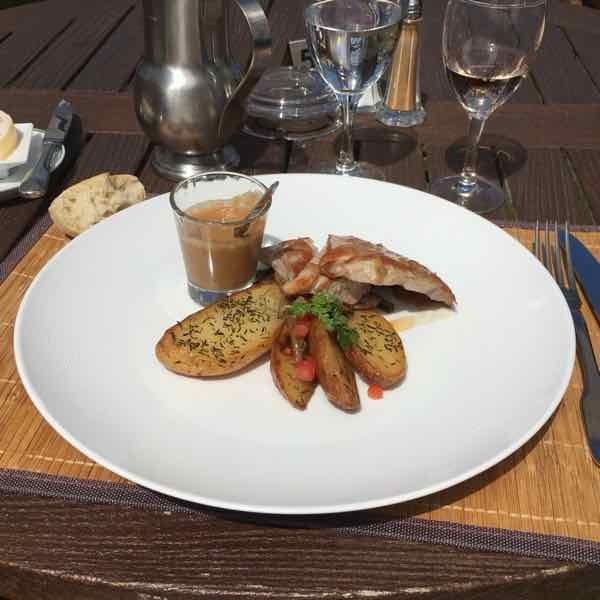 Everything was perfect as it was a reasonably priced lunch with a view of Etretat. The Dormy House restaurant patio, which overlooks Etretat had more than just tables and chairs. There was a garden area with lounge chairs and side tables, so it would have been perfect to come here for an apéritif before dinner. There were many spots to sit and the view of Etretat and the water was pretty much unobstructed. 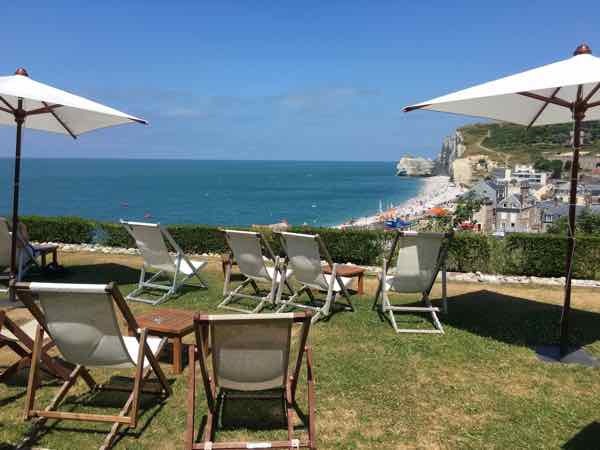 Other than the Restaurant du Golf Etretat, I don’t think there was any other place perched high on the cliffs that provide such a vista of the sea and town. 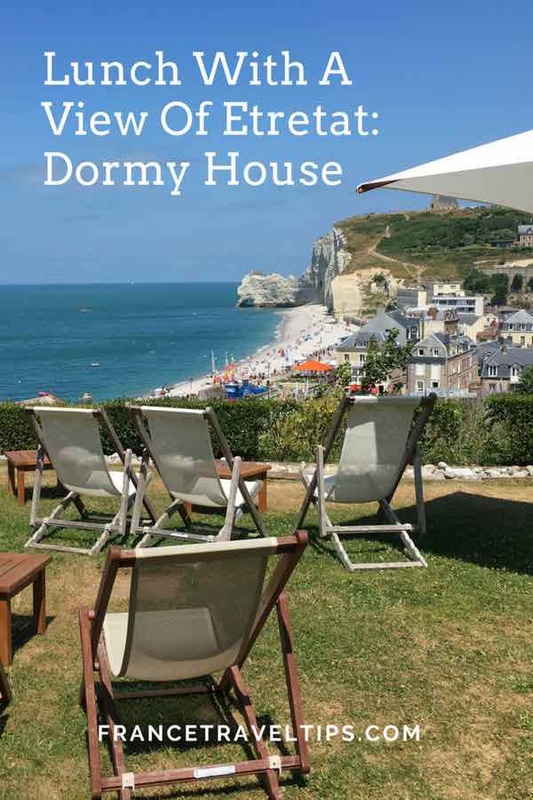 As Etretat is renowned for the falaises (cliffs), what better place than at the Dormy House. 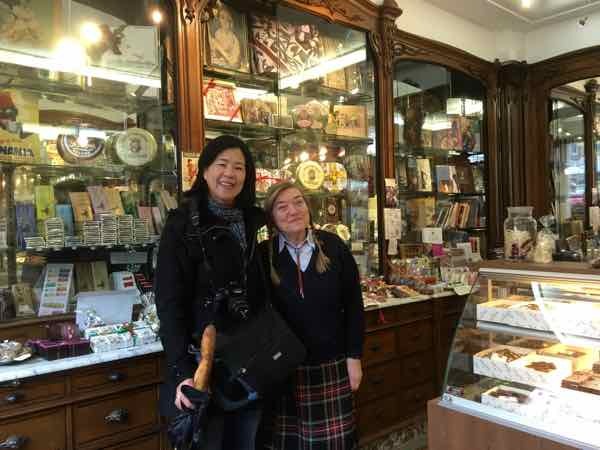 I think I was very fortunate to have visited during a quiet day. It also helped that it was lunchtime. I can only imagine how spectacular the sight would be at sunset. 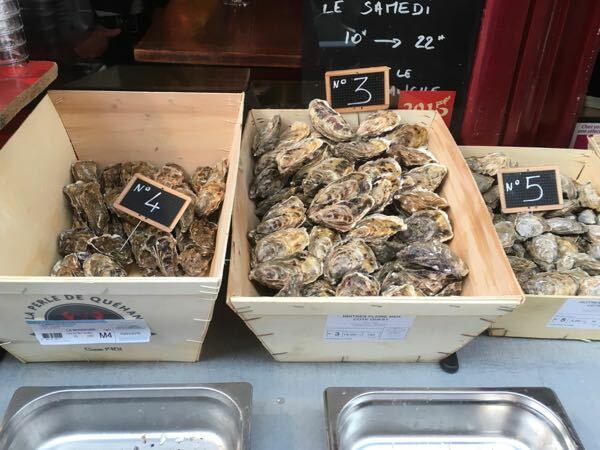 The Dormy House serves traditional French cuisine and its menu has a wide selection of entrées and plats (main courses), and a number of seafood dishes. Wines and ciders come by the glass or bottle. Sadly, they didn’t have any pichets (carafes with 250 ml or 500 ml) of wine. Quickly after seating me and taking my drink order, the waiter served me my wine and took my lunch order. And then I waited and waited. While the service was a bit slow, it was friendly. I wasn’t about to complain because I had a fabulous view. 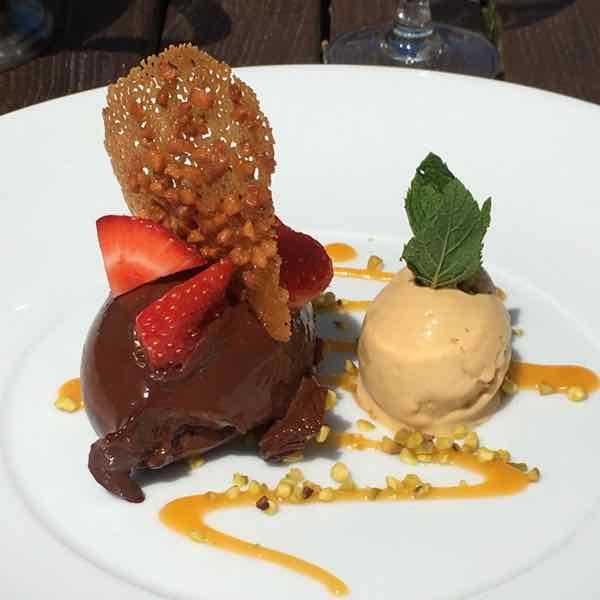 I was eating in such a relaxed atmosphere and the weather could not have been better: a slight breeze, lots of sunshine, not too hot and surrounded by stunning surroundings. I stayed about 2 hours and if I had been dining with others, I’m sure the meal could have lasted 3 hours. 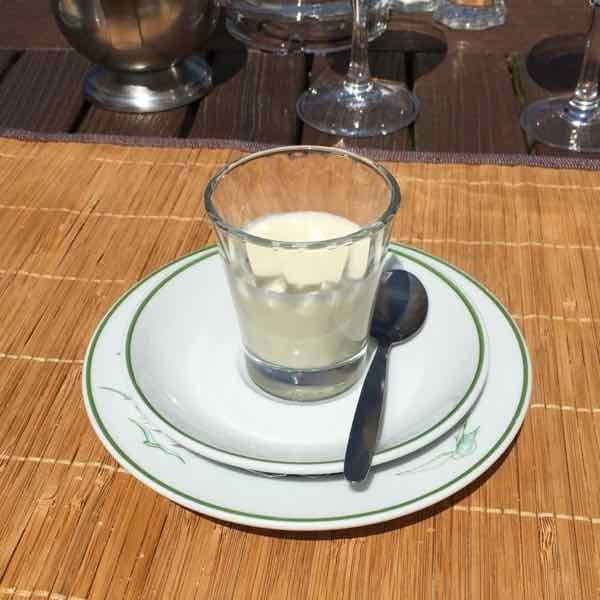 If you’re in Normandy and want to eat out, why not go with a place that has a view of the Cote d’Albâtre (Alabaster Coast). 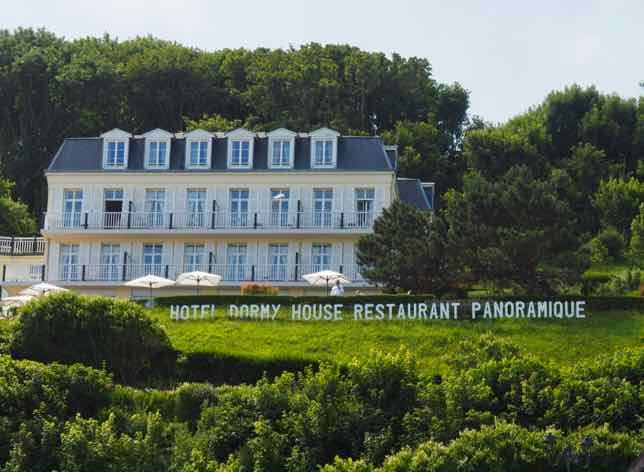 That place is certainly in Etretat and while dinner will definitely be much more expensive, I highly recommend you consider going to the Dormy House for an unrushed, reasonably-priced lunch where you’ll get panoramic views of Etretat. Make reservations just in case. You might not be as lucky as I was to get a table just by dropping in. Your Guide To Using Lavender and Lavandin Oil Is It Wrong To Attend La Course Camarguaise (Provencal Bullfighting)? What a view! It’s definitely on my list of places to visit.